Students may choose to substitute purple threads for the blue ones in the model. 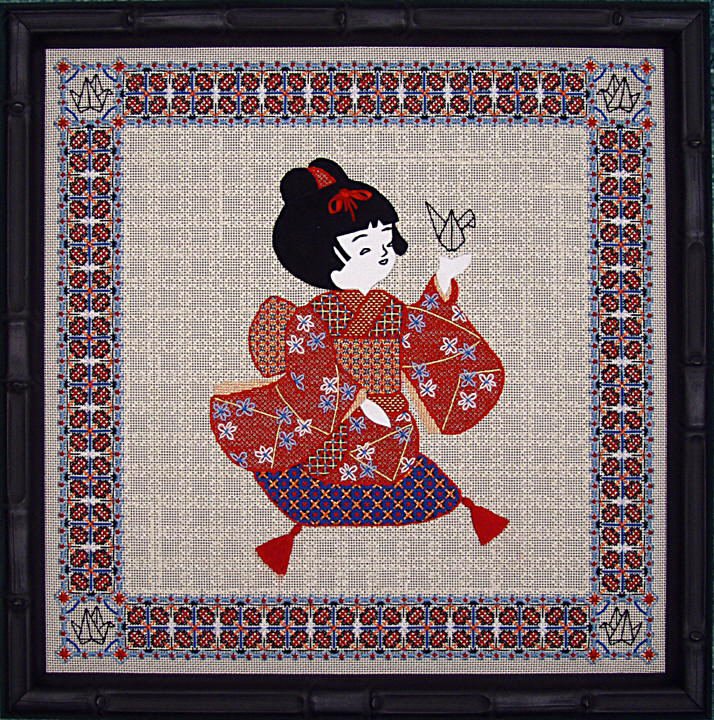 This figure of a young Japanese girl is adapted from a form of indigenous paper relief art called “kurumie.” Five years ago I taught a similar figure of a sprightly Japanese dancer, which was titled Kurumie, and I never intended to offer a “sequel” to this piece. However, when I taught this class, I always showed this charming example of the art form, which I had purchased in Kyoto the year before. A number of students encouraged me to do a stitched version of the kneeling figure so here she is! BORDER. Because I liked the colors of the original design source, I developed an appropriate original border for this design using blues and mandarin reds with black and white accents. A four-way arrangement of a Diagonal Partial Pavilion variation is used for the main framework of the border, and it is outlined in an isolated blackwork motif that is common in Japanese designs. The inside and outside edgings are composed of Tied Oblong Crosses with red seed beads inside the small diamond area between the units. There are a total of eight steps in the border, including a diamond framework in red-orange Petite Sparkle Rays and a square framework in bright blue Petite Very Velvet. The corner repeats of the border are filled with outlines of small Origami cranes to give the design a theme that is appropriate. The figure is also holding a small Origami crane ornament to echo this theme. long center stitch that straddles three intersections with shorter side stitches that straddle two intersections. The “reversed” unit has a short center stitch with longer side stitches and because this unit has indentations, the four-way version forms striking negative space when used as an open background pattern. By eliminating every other row of four-way clusters, some interesting diamond repeats form between the intersecting rows. FIGURE. The figure itself is dressed in a traditional Japanese kimono. The skirt, bodice and sleeves will have a foundation layer of open diamonds executed in a mock Alicia Lace, which will have scattered plum blossoms in blue and white Lazy Daisy stitches added on top. The obi and remaining kimono areas are embellished with appropriate diaper patterns — both are small-scale couching patterns. The small triangular linings along the sides of the sleeves are filled with Encroaching Gobelin in peach metallic. The lining around the cuffs is a Stem outline filling. The face and hands of the figure will be executed with white ultrasuede appliqués. The facial features will be topstitched after the applique has been mounted. Because the hair style needs to have dimension, it will also be interpreted in padded ultrasuede. It will overlap the face and be trimmed to simulate the bangs and side wisps. The split bun and the crown will be will be slightly padded with random cross stitches to suggest the appropriate roundness. A stem or couched outline will be added to provide the appropriate definition between the two hair areas. The small bow in the front will be added with some of the red Petite Sparkle braid and velour, and the decoration over the bun the same Alicia Lace diamonds with Stem outlines along the edges. PILLOW. This pillow is embellished with a third diaper — a bold arrangement with a main framework of four-way Hot Wheels (a Scotch variation). Some small “mock” tassels are added to the front corners. THREADS. All the threads in the border and background will be used again in the figure along with some additional accents. These include a #8 pearl cotton in ecru, black, white, light blue and red, #5 pearl cotton in blue and red, red-orange and light blue Petite Sparkle Rays, turquoise Petite Very Velvet, peacock blue Impressions, gold Coronet braid, and Kreinik peach metallic. Red Mandarin floss is used for the tassels. COLOR CHOICE: The color scheme for the model is close to the original design source. The red and peach shades and black and white accents will be common to every class kit but students may choose to substitute purple accents for the blue threads. MATERIALS TO BE PROVIDED BY THE STUDENT: 2 HiLiter pens, a laying tool, embroidery scissors, cuticle scissors for cutting suede, clamp or weight to secure frame to the working table, lamp and/or magnifier, if needed, along with an extension cord. TEACHER'S CLASSROOM NEEDS: Marker board with accessories or any acceptable alternative. U-shape arrangement for student tables preferred. Need large table somewhere for exhibit of visual aids. Small table needed in front near board for teacher's notebook and stitched model. 1. To offer ideas to students on how to coordinate a theme motif with an appropriate border to create a complete design. This interpretation is a more mixed media approach to the usual silk and metal techniques used in oriental designs. 2. To share my methods of choosing compatible stitches and colors for borders and backgrounds to control the scale and balance within the design. These areas should unify a design rather than compete with it. 3. To share ideas for developing original patterning in general — emphasis here on composite patterns that combine two or more stitches or stitch treatments. 4. To share ideas for interpreting figures in general and for stitching garments — e.g. shifting patterns in separate folds to add realism. Other face and hair treatments will also be discussed and examples of other figures will be shared in class.